Shaving was optional. Many lunar explorers returned to Earth with two weeks' growth proudly displayed as they stepped off the helicopter following their recovery. Others chose to shave even though it could be difficult. Mike Collins did a bit of both, returning to Earth with a decent moustache. Although these normally fastidious men tolerated such limitations to their personal hygiene for the duration of a mission, many began to be irritated by them towards the end and were only too glad to get back to Earth and cleanliness. Michael Collins displays his Moon moustache after the recovery of Apollo 11. Neil Armstrong and Buzz Aldrin are alongside. Above. Ed Mitchell shaving on Apollo 14. Below. 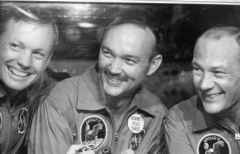 Three bearded crewmen on Apollo 15 line up for their press conference; David Scott, Al Worden and Jim Irwin. ''Well it did use up a fair number of tissues to keep wiping it off,'' said Aldrin. Jack Schmitt tackling a wet shave on Apollo 17. "Roger. We'll admire the beautiful picture for a few minutes here,'' complimented Henize. The crew appeared on camera in a row. Scott was camera-left, Worden in the middle and Irwin on camera-right. 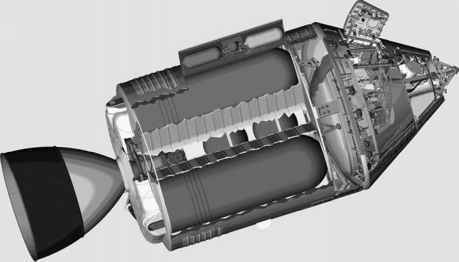 Behind them was the lower equipment bay with the optics above Scott's head and the DSKY between Scott and Worden. All were sporting over 10 days' growth on their chins. "It's just because we haven't shaved in two weeks,'' Irwin reminded them. "Is that a fact?'' said the laconic Worden. Irwin: "Yes." 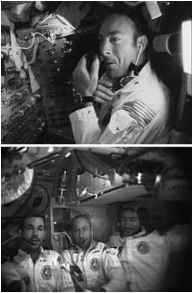 By Apollo 16, John Young and his crew were still comparing wet shaving with mechanical shavers. "Well, you looked pretty bloody, John, the time you used it,'' Duke reminded him. What kind of wind up razor was used on apollo? How did they shave on apollo?